Saturday August 15th 1896 I baked some things this morning and made pressed chicken. I cleaned up the house in the afternoon after it had stopped raining. Will went to town. George Stevens brought Laura & Martie up to stay. Sunday August 16th 1896 I was busy in the morning but read some before dinner. The afternoon was spent in talking. I had supper early. Mr Metcalf and George Stevens came to take the girls to ride. Charlie McCallister was here for supper and spent the evening. Monday August 17th 1896 The girls did most of the washing while I did the other work and got dinner. Will and I went down to Henry Birds to look over the place. It was late when we got home. George & John Stevens spent the evening here. Tuesday August 18th 1896 The girls did all the ironing this morning. I found so many other things to keep me busy. We took the girls down town in the afternoon. We were over home awhile. Came home in time to do chores. 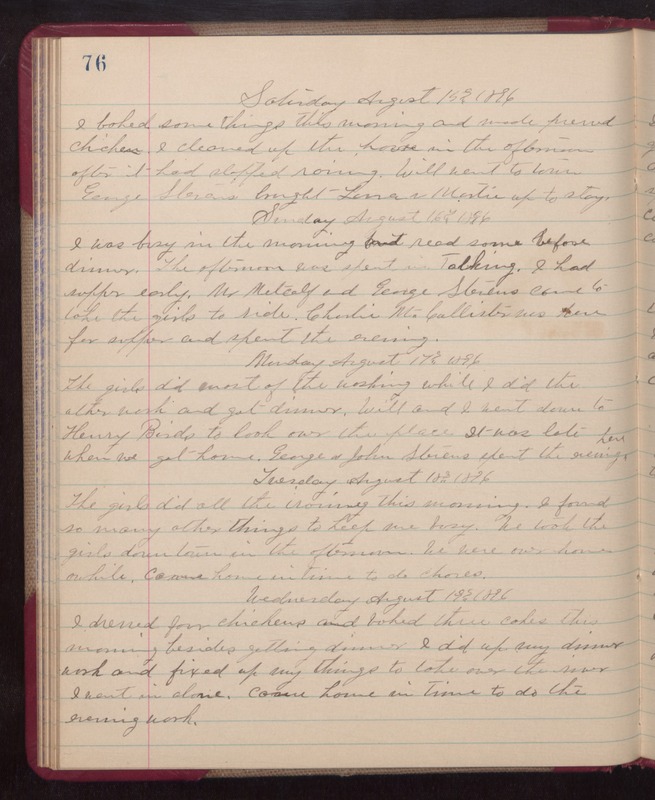 Wednesday August 9th 1896 I dressed four chickens and baked three cakes this morning besides getting dinner. I did up my dinner work and fixed up my things to take over the river. I went in alone. Came home in time to do the evening work.